Grassley: "Even if it’s embarrassing it ought to be out there. We spent a lot of money with this study." WASHINGTON -- A U.S. government report that could lead to tariffs on automobiles is likely not being released by the White House because it lacks rigor and could deal a political setback for President Donald Trump, a top Republican senator said Wednesday. Commerce Secretary Wilbur Ross submitted his report on the national security implications of imports of vehicles and car parts to the president on Feb. 17, starting a 90-day period in which Trump has to make a determination what, if any, action to take. The president could also take steps to further delay a decision. Trump has repeatedly threatened to hit imported cars with a tariff of as much as 25 percent and has been particularly focused on the European Union. A spokeswoman for the Commerce Department declined to comment. Lawmakers from both parties have pushed for the report to be made public after the White House in February declined to release the findings of Ross’s study. Trump’s threats on auto tariffs have also sparked work on bipartisan legislation to curb his trade authority. 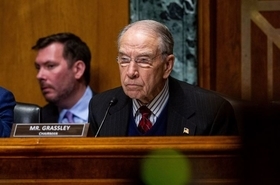 Grassley is overseeing the effort on the Senate side and pledged to write a bill that could override Trump’s likely veto over any effort to curb his tariff powers. Regardless of the political implications for Trump, Grassley said the public should be informed about the contents of a report that was financed by taxpayer dollars. Grassley said: “Even if it’s embarrassing it ought to be out there. We spent a lot of money with this study."